I love croissants as much as anyone, but they take so long to make! This is a little recipe that I made up called “Pane Zebra,” or Zebra Brioche. It is super simple and easy to make, and looks so elegant and fancy! All of those thin, delicate little strips of chocolate really add something special to these sweet, fluffy breakfast rolls, which is why I named them Pane Zebra. These rolls have a base of Cuban Pane Suave, a delicious sweet roll from the island of Cuba, which can be made super easily in the bread machine. I filled it with a cocoa block and rolled it out multiple times to get the striped chocolate effect. Your morning will certainly be brightened by these little stripes of chocolate. Look at those zebra stripes! Add the ingredients for the pan suave in the order directed by the manufacturer. Select dough cycle. Prepare the Cocoa Block: In a bowl put the egg white with the sugar and flour and stir to obtain a smooth and creamy consistency . Pour the milk in a saucepan and bring to boil, add the cocoa and stir quickly. Add the egg white mixture and stir and cook until thick. Quickly add the butter and stir. Let cool at room temperature. Put the cocoa mixture between two sheets of plastic film and press to form a square (you can use a rolling pin) and then put it into the fridge. 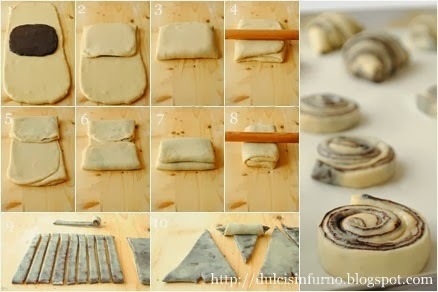 Cut the dough into 1/2in strips and roll to form the rolls or cut into triangles and shape into croissants (9-10). Put Them on a baking sheet and the rise for about 1 hour. I decided to go all out and topped mine with a fun hodgepodge of sprinkles (hey, this is funfetti right?!) — which included little pink dinosaurs, mini race cars, and a bunch of other loud, sparkly sprinkles. Looks like a party to me! Beat the canola oil, egg, milk, vanilla extract, and sugar together. Add in the flour and baking powder. Add in the sprinkles. Don’t over stir. Pour into two prepared muffin liners in a muffin pan. In a medium bowl, beat butter and 1 cup of powdered sugar together using a hand mixer. When combined and fluffy, add 2 teaspoons water and the vanilla and mix until combined. If the frosting is too stiff, add more water. If the frosting is too runny, add more powdered sugar. Frost your cupcakes, and top with fun sprinkles! Ever find yourself in the mood for a cupcake? A nice, rich, moist, chocolate cupcake? But you don’t have the time/ingredients/need for an entire batch of 12? I found myself in one of those moods, and I wanted a quick, no-mess, recipe that would give me two cupcakes, one for me, and one to share. And here it is! I topped these luscious chocolate-y cupcakes with a chocolate buttercream that had just a hint of coffee — because I believe there are few better flavor combinations than coffee and chocolate. I love the idea of making cupcakes in batches of two, as extra cupcakes are not the easiest thing to pop in my bag and share with friends (especially with all of that pretty icing!). So relax, and enjoy a batch of cupcakes just for you and someone special, and for once don’t worry about what you’ll do with the extras. Preheat oven to 350 degrees. Whisk all the dry ingredients together in a small bowl. In a second small bowl or spouted measuring cup, combine the wet ingredients. Add the dry to the wet and stir till combined, whisking well. Add the chocolate chips (who doesn’t love extra chocolate?!). Bake for 18 minutes or until a tester comes out clean. Allow to cool before frosting. *you may have a little bit of frosting leftover, as I like my cupcakes with a lot of icing! In a large bowl, cream butter until smooth, then gradually beat in sugar, cocoa, and coffee. Blend in vanilla. Beat until light and fluffy. If necessary, adjust consistency with more milk or sugar. I’m a big fan of the chocolate+salt combination (think Ina Garten’s Outrageous Brownies). I am an even bigger fan of Nutella (one of the best inventions ever). In these perfect little cookies, the beloved chocolatey, creamy, hazelnut spread is balanced with the savory, coarse sea salt — a match made in heaven. Sift together the flour, cocoa and baking powder. In a separate bowl or a standing mixer, cream together the sugar and butter until light and fluffy. Add the vanilla and Nutella to the sugar-butter mixture. In 2 additions (beginning and ending with the dry ingredients) add the milk and dry ingredients. Chill the dough in the fridge for about 30 min. Take the dough out of the fridge, and preheat the oven to 325 degrees F.
Roll the dough into 1 inch balls and place on a baking sheet with parchment paper. Slightly press down each of the balls and sprinkle with sea salt.